Make your own case for your LG K10. Choose your favorite photo or design to print on the back. A unique and stylish case designed to your liking! A personalised phone case makes your LG K10 unique. We believe that there is one phone accessory that is more essential than all else. One that no one should ever forget: a phone case to protect your device. Do you want to protect your phone and keep it brand new? Well, personalised phone cases not only protect your phone, but they provide your LG K10 with a style that is unique to only you! Your design will be printed using UV on the back side of your case using scratchproof ink, so your printed image should not fade away over time! The sides of the case will be transparent, regardless of your design. The soft case is made of a silicon material that will reliably protect the back and sides of your phone from any damage. Personalised phone cases do not only provide a unique appearance, but provide the necessary protection that allows your phone to remain in top condition. The soft case has strategically placed openings for all buttons to ensure that you can use your device as intended. Designing your custom LG K10 case is simple! By using our online customiser, making a personalised phone case for the LG K10 is a breeze. The only difficult part of the process is making sure you choose the perfect picture to use! You can use all kinds of images, whether they are photos, logos, designs, etc. It’s fun and challenging at the same time. Do you want to have a photo of your best friends on your phone case? Or perhaps a photo of a loved one? We offer you the possibility to upload photos directly from Facebook, Instagram or your computer’s hard drive. There are plenty of options for you to choose from to make your personalised phone case exactly to your liking. If you cannot decide, we also have plenty of pre-made designs in our customiser that you can choose from. Design, order, then we will get to work! Make your personalised phone case for your LG K10 in no time! Once you’re done designing your personalised phone case, we print and send it off as quickly as possible. By using an advanced printing technique and high quality ink, your design will come out looking sharp. Once you order is placed we cannot wait to get started! We work quickly and with care to print personalised phone case to the highest quality. Our shipping is quick and reliable, with several options depending on your needs! 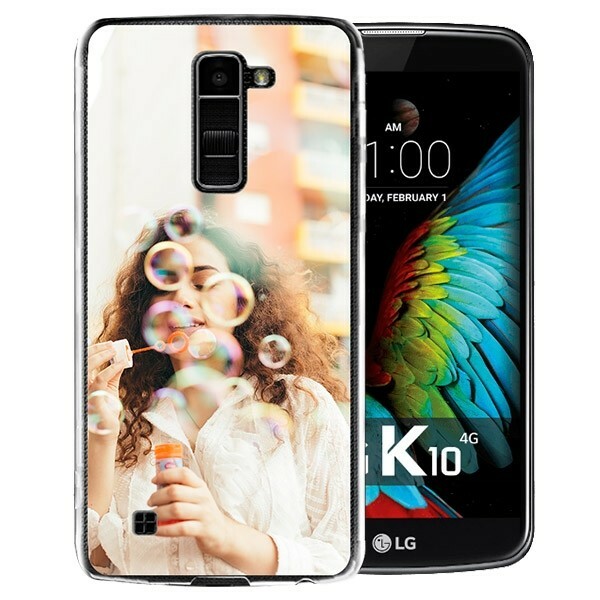 The only thing you need to do is to make your own phone case for your LG K10 and we do the rest. If you have further questions, simply contact support@gocustomized.co.uk and we’ll get back to you ASAP!